Need Assistance Getting Started With Akynzeo®? 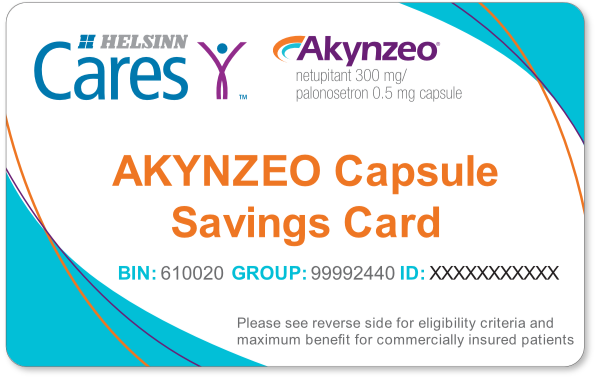 The AKYNZEO Capsule Savings Card is available for eligible patients with commercial insurance. Helsinn will pay up to $50 copay savings per AKYNZEO capsule prescription. Please present the card to your pharmacist, no activation or enrollment is required. If your doctor hasn’t given you a card, download a card and print it at home. If you have any questions, please call 1-84HELSINN-U (1-844-357-4668). *Restrictions apply. Not available to patients enrolled in state or federal healthcare programs, including Medicare, Medicaid, Medigap, VA, DoD or TRICARE. Eligibility Criteria: Good toward the purchase of AKYNZEO Capsule prescriptions. No substitutions permitted. Save the card to reuse with each prescription. Not available to patients enrolled in state or federal healthcare programs, including Medicare, Medicaid, Medigap, VA, DoD or TRICARE. Offer available to MA residents through December 31, 2019. For all others patients, this offer will expire December 31, 2019. Good toward the purchase of AKYNZEO Capsule Prescription. May not be combined with any other coupon, discount, prescription savings card, free trial or other offer. Federal law prohibits the selling, purchasing, trading, or counterfeiting of this card. Such activities may result in imprisonment of 10 years, fines up to $25,000, or both. Void outside the USA and where prohibited by law. Helsinn Therapeutics (U.S.), Inc. reserves the right to rescind, revoke, or amend this offer at any time without notice. Patients and pharmacies are responsible for disclosing to insurance carriers the redemption and value of the card and complying with any other conditions imposed by insurance carriers on thirdparty payers. The value of this card is not contingent on any prior or future purchases. The card is solely intended to provide savings on any purchase of AKYNZEO Capsule Prescription. Use of the card for any one purchase does not obligate the patient to make future purchases of AKYNZEO Capsule Prescription or any other product. © 2017 Helsinn Therapeutics (U.S.), Inc. All rights reserved.